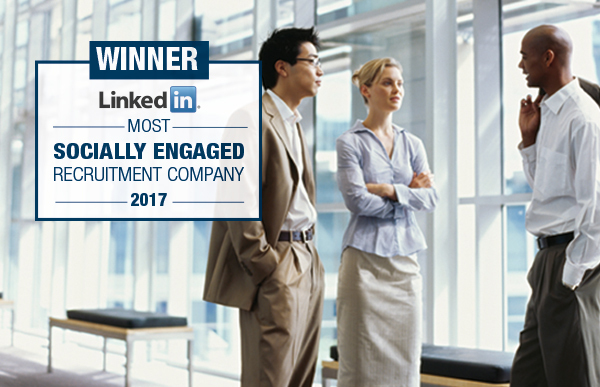 On Thursday 19 October 2017, PageGroup was awarded ‘World’s Most Socially Engaged Recruitment Agency’ on LinkedIn. Receiving first place globally in the award that recognises the top socially engaged companies in the recruitment industry, PageGroup scored highly on Content Marketing, Social Reach, Social Engagement and Social Recruiting for all activity on the LinkedIn platform. To determine the rankings, LinkedIn analysed thousands of data points for more than 60,000 Search and Staffing companies, between September 1st 2016 and August 31st 2017. The analysis took into account social reach, employee engagement, employment brand and the content marketing power of search and staffing firms on LinkedIn. “Our strategy is to deliver ‘seriously useful’ content through a personalised approach to communication with clients and candidates, and to ensure our consultants have the content they need to build their own personal brands on social. This recognition from LinkedIn is very welcome and we will continue to ensure that good quality sharable content is right at the heart of our approach”, explains Mr. Collins.